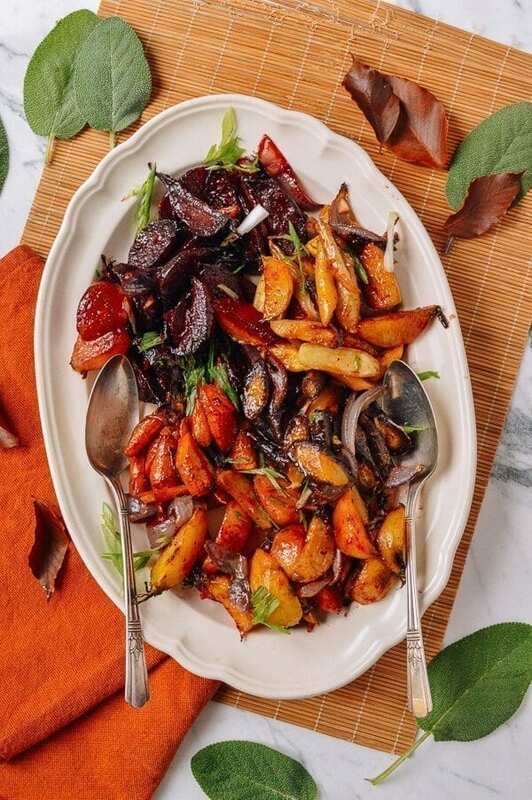 This miso glazed roasted root vegetables are buttery, salty, and a little bit sweet––it's the perfect side dish for any fall/winter meal, Thanksgiving side or any holiday side dish. Preheat the oven to 425 degrees F. Spread the vegetables out on a parchment-lined rimmed baking sheet. Drizzle with olive oil and sprinkle with salt and pepper. Roast the veggies in the oven for 45 minutes, until crisp on the outside. In the final 10 minutes of roasting time, make the glaze. Melt the butter in a saucepan over medium heat. Add the garlic and cook for 3 minutes. Whisk in the miso paste, mirin, maple syrup, and cinnamon. Bring to a simmer and bubble for 2 minutes. Pour over the vegetables, toss, and arrange on a platter. Garnish with scallions if desired. Serve!